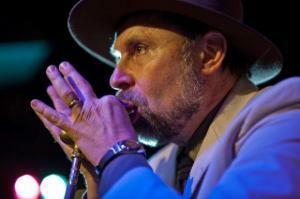 We were fortunate to catch up with renown band leader and harmonica player Pierre Lacocque recently. He is a founding member of the iconic band, Mississippi Heat, which is currently enjoying the success of their well received latest album, Cab Driving Man, on Delmark Records. Here’s what he had to say! It has to be the harmonica. The harmonica has always been the instrument that spoke to my heart. I like the piano too, and I have certainly dabbled in the piano, and for some reason, it did not take over, even though I love the piano’s sound. The harmonica is the most – the closest to what I feel inside, so the harmonica has always been my instrument. When did you start playing harmonica? I was 17 years old and it was as a guest to Junior Wells at Theresa’s Lounge, on the South Side of Chicago. I was 17 and I was about nine months into the instrument. I was of, very very bad. I did not know that at the time. However, Junior Wells was extremely gracious with me, and invited me onstage, a few times on that year. We became instant friends and cemented a connection for life, for life; it never stopped. I can not explain it. So, Junior Wells is the one that invited me onstage for the first time. What has been your worst experience? The worst experience for me is definitely a bad amplifier when I’m on the road. In Europe, they provide instruments for us, so we do not fly with our amplifiers. So, the worst experience for me is to make it through the night with an amplifier that does not respond in a warm, tube way, you know, the way I like it. So, I have learned over the years to accept, and just do the best I can with what I’ve got, even though it’s really, physically, it’s emotionally difficult. On the other hand, it is what it is. So, as opposed to giving up, I still play my heart out the best I can and give the public, me, and the best I’ve got. What I am proud of is something that is God-given really, in the sense that I seem to have a continuous drive to create, and to master the instrument. I’m never satisfied, never satisfied with my playing, with my skills, with my technique. So, I have a drive to be continuously creative. I don’t know where that comes from, except, I’m proud of it because to write, to compose songs and to come up with phrasing for the harmonica that are totally my own. I think in my career I have a distinct sound. I’m proud of that. What, if anything, have you wanted to accomplish with your music, and have you succeeded? Well, one that I am quite pleased with and it’s a blessing, with the years the name of the band has grown among fans. So we are more in demand, now more than ever. We travel the world and we go many different places. It’s a pleasure to be recognized as a band, and certainly, as a band leader. Also, the public seems to continuously be positive about us, so it’s very encouraging. So, it’s hard hard work that is being recognized down the road. I’m sure many of my blues colleagues can understand. Everybody works hard; everybody wants a break, because, you know, it’s our soul. Music is our soul. In my case, I have to say, I feel very content with the way the band is going.